Infotek is a company based in the city of Manado, North Sulawesi, Indonesia, doing businesses in the solution provider of IT (Information & Technology), which includes computer networks (LAN / WAN / WiFi / Long range wideband wireless), global access to the internet and web hosting. The company was founded in 1999 under the name of CV. Infotek, started as a consultant in the field of Information Technology and providing Internet Cafe services with the name of Cyberspace UNSRAT - Gateway to Information and Education, located in the library area of Sam Ratulangi University, Manado. The original task force is as shown on the picture above from left to right : Lucky Mangkey, Nielson Assa, Suleman Lamuda, Herken Anggas, Insan Balandatu, Mon Winowoda, Sofyan Inkiriwang, Jasin Junus (the one with the camera who took the picture). In 2005 Infotek formed subsidiary company called PT. Informasi Teknologi Multimedia to conduct in the business of provider of network access to the global internet, as an Internet Service Provider with ADSL technology to its customers. Infotek in 2009 in collaboration with Regional Division 7 Multimedia PT. 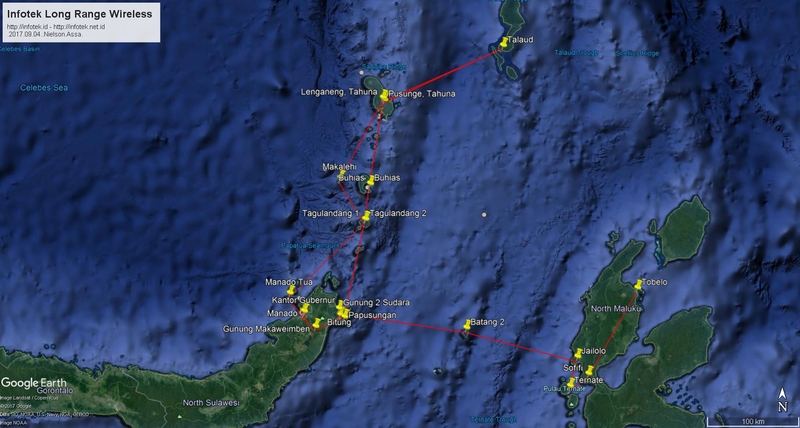 Telkom, contribute to the WOC, CTI Summit & Sail Bunaken in providing access to the global internet and used by the participants, using wideband wireless radio technology. Infotek in 2011 in collaboration with Regional Division 7 Multimedia PT. Telkom, also supports the IP network camera at the ARF-Direx international event in Manado, as well as providing free internet access in the media center of ARF-Direx at Aryaduta hotel and Manado central post office area. In December 2011, Infotek in collaboration with Military official Korem 131/Santiago in streaming video, breaking the program Indonesian Muri record for blood donations in the Sulawesi military region Wirabuana Kodam VII, with the total units of bloods are collected as many as 14.318.000 bags. In January 2012, in cooperation with Uner 7 PT. Telkom, provides internet facilities at the venue of Asean Tourism Forum, monitored more than 600 pc / laptop / smartphone connected to 10 Wifi Access Points on the area. In June 2012, in collaboration with UPTD PSIT (Development of Information Systems and Telematics) Regional Government of North Sulawesi and Coral Triangle Initiative team, Infotek helped the 1st year celebration of CTI Summit event, which held at Poopoh village, Tanawangko. In February 2013, in collaboration with UPTD PSIT, Infotek provide facilities and free wifi internet access to the public at the National Press Day event in 2013, held at Hotel Grand Kawanua Novotel. Starting on January 2014 to expands it's business, Infotek collaborate with PT. Orion Cyber Internet for Internet Service provider business and start using the name of Orion Manado. In February 2014, Infotek formed another company called PT. Infotek Global Network. The purpose of this company are to work together with PT. Orion Cyber Internet on the business of ISP and also to prepare PT. Infotek Global Network to have it's own license so it can do ISP business nationwide in the future using and under it's own name PT. Infotek Global Network. As of January 2016, Infotek become one of the proud member of APJII (Asosiasi Penyelenggara Jasa Internet Indonesia) or Indonesian Internet Service Provider Association with Registration Number : 469. The membership recognition are as follows : APJII Certificate 2016, APJII Certificate 2017, APJII Certificate 2018. In December 4th, 2016, in collaboration with Dishubkominfo Pemprov Sulut, Ubiquiti Spectrumindo Surabaya, Mega Jasa Kelola and SS Computer Manado, Infotek providing Free Internet Access for public at the 2016 Christmas Celebration Concert at Mega Mas Square, Manado. The event was attended by thousands of people and some of the crowds does use the internet provided for free that time. Infotek use Ubiquiti Unifi Mesh as Wifi Access Points with SSID : #SULUTHEBAT. In December 27th, 2016, again in collaboration with Dishubkominfo Pemprov Sulut, Ubiquiti Spectrumindo Surabaya & SS Computer Manado, Infotek providing Free Internet Access at the event of, The Official Indonesian Christmas Celebration 2016 at Tondano, North Sulawesi. The ceremony was attended and opened by Presiden Joko Widodo. The free internet wifi was also using Ubiquiti Unifi Mesh as Wifi Access Points with SSID : #SULUTHEBAT. In January 2017, PT. Infotek Global Network through the decree by Minister of Communication and Information of the Republic of Indonesia Number 303 Year 2017, Infotek officialy became the first Internet Service Provider originate from Manado, North Sulawesi. With the release of the Internet Access Service Provider license, starting in February 2017 Infotek will start doing internet services with the target throughout Indonesia under the name PT. Infotek Global Network as a national ISP. Infotek's network infrastructure as of 2017 spread over Manado, Tomohon, Bitung, Tagulandang, Siau, Tahuna, Talaud, Ternate and Tobelo. The amount of Infotek's customer's computers online every day during peak hours totaled more than 5000 computers, which includes customers of Internet Cafes, Online Game Center, local & international companies, Hotels & Resorts, Tour & Travel agencies, Printed & Online Media companies, Universities and schools, Local Government offices, Police & Military, Public Hotspot. Network peripherals and network technologies used by Infotek included CentOS & Ubuntu Linux Servers, Gigabit Manageable Metro Switches, Multicore Routers, Long Range Wireless Ubiquiti M/AC/AirFiber series, Long Range Wireless Motorola/Cambium, Long Range Wireless Ligo, IgniteNet Wireless & Fiber Optics cable networks. One of the advantages of the internet network provided by Infotek is to have the bandwidth per personal computer management system for all customers. The similar system found in Allot's NetEnforcer network devices - http://www.allot.com. Where each computer that uses Infotek's internet access will get their own bandwidth quota equally as given by the system, so access to the global internet will be smoother and problem can be minimized in the last mile connection. With the technology and network infrastructure keep moving forward and develope new features as for the market demands, and the rapid advancement of computer network technology, Infotek aims to be IT service providers with the best solutions and with the investment costs as low as possible, so it can reach the entire community particularly the city of Manado and North Sulawesi provincial at large.